OM yoga is a practice of flowing yoga asanas informed by precise attention to alignment and supported by the relaxed wakefulness of Buddhist mindfulness meditation.OM Yoga is not owned by or affiliated with a larger entity (as many studios are these days). 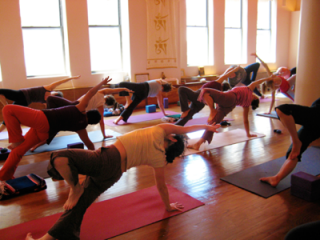 OM yoga is owned and operated by one small, dynamic entity -- Cyndi Lee. In the early 1990's Cyndi Lee, like many yoga teachers, was a migrant in New York City, going from gym, to rented studio for private lessons or small one-off classes, to teaching other methods of yoga for hire at various studios. After a while, she noticed that people were following her around, engaged by her humor and her unique style.